The Wireless Festival is a music festival in England that takes place every year in London, took place at Harewood House, Leeds in 2006 and 2007, and took place in Perry Park, Birmingham in 2014. It is owned and managed by Live Nation. From its inception in 2005 until 2008, the festival was sponsored by telecommunications company O2, and was called the O2 Wireless Festival. From 2009 to 2012, the main sponsor was Barclaycard and the festival renamed to Barclaycard Wireless Festival. For 2013, the sponsor changed to Yahoo!, and was renamed to Yahoo! Wireless. The 2014 Wireless Festival was held in Finsbury Park in North London for the first time, as well as Perry Park in Birmingham. The 2015 Wireless Festival took place at Finsbury Park and was sponsored by the fashion retailer New Look with an extra day added due to it being 10 years since the first event. In 2017, Live Nation also established Wireless Germany, in Frankfurt. 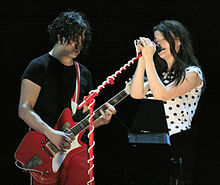 In 2006, the festival played in both Hyde Park and Harewood House. Tickets were £37.51 per day. Tickets for both venues went on sale on 16 March 2007 and the festival took place between 14–17 June in Hyde Park, and 15–17 June at Harewood House. Tickets were £40 for one day, £75 for two, £105 for three or £135 for four days. Kaiser Chiefs, Editors, The Cribs, The Rakes, The Twang, The Only Ones, Kate Nash, Ripchord, The Duke Spirit, Polysics, Mumm-Ra, The Pigeon Detectives, You Say Party! We Say Die!, Los Campesinos!, and Under the Influence of Giants. Kaiser Chiefs selected the line-up for the day they were headlining (Saturday at Harewood House and Sunday in Hyde Park). Faithless, Badly Drawn Boy, Kelis, Just Jack and Cat Empire. For the first time, the Leeds festival offered camping facilities at the festival. Campers were allowed to stay on Lord Harewood's land for £25 for as many festival days as they wished. There were 3 stages this year, and the O2 Blueroom where only O2 customers were allowed to enter. The 2008 O2 Wireless Festival spanned 4 days in Hyde Park, and was the last to carry the O2 sponsorship. An attempt to hold a parallel festival in Leeds similar to the Reading and Leeds Festivals arrangement was unsuccessful, and instead a variety of club nights featuring billed artists were held. Tickets were £45 per day. Missy Elliott performance in Saturday, 3 July. Sunday, 4 July: Jay-Z, Lily Allen, Friendly Fires, Slash, Mr Hudson, dan le sac Vs Scroobius Pip, Chipmunk, Tinie Tempah, Chase & Status, D12, Wiley, Roll Deep, J. Cole, Chiddy Bang, Wale, Professor Green, Laura Steel, Talay Riley, McLean, Bluey Robinson, Hesta Prynn. The Sunday date sold out in record time, three weeks before the festival. The 2011 Wireless Festival was held from Friday 1 July to Sunday 3 July 2011. Tickets were £48.50 (Saturday/Sunday) or £49.50 (Friday) for one day, £92 for two and £130 for three days. The Black Eyed Peas headlined the Friday, The Chemical Brothers on the Saturday, and Pulp reformed after ten years to play the Sunday and other festivals in 2011. The Black Eyed Peas date had sold out by the end of June, while tickets for the other two days remained on sale until the festival. 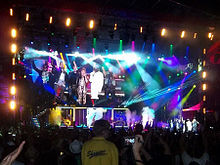 The 2012 Wireless Festival was held from Friday 6 July to Sunday 8 July. Tickets went on general sale on 18 November 2011, priced at £49.50 (Friday/Saturday) and £52.50 (Sunday), plus booking fee. All tickets for the Rihanna day sold out by the end of March, a new record for the festival. The 2013 event was moved to the Queen Elizabeth Olympic Park in Stratford after Live Nation pulled out of the tender for Hyde Park due to curfew issues. The festival was held from Friday 12 July to Sunday 14 July 2013, and tickets were priced at £57.50 for day tickets and £110 for two days, plus booking fees. The event was being sponsored by Yahoo!. In February 2014 it was confirmed that Wireless Festival 2014 would be held at Finsbury Park, London and Perry Park, Birmingham. The event was held over the weekend of 4–6 July 2014, on three stages. London day tickets were priced at £71.50 while Birmingham day tickets were priced at £68.75. Weekend tickets for London went on sale at £210 while Birmingham weekend tickets were set at £172. On 3 July, the day before the first day of the festival, it was widely reported that Drake had pulled out due to illness, (making it the second time he had pulled out of a Wireless Festival). This was confirmed on the festival's social media sites and organisers announced that Kanye West would play instead of Drake in London, and Rudimental (who had been the support for Drake) would headline the Saturday in Birmingham with a special extended set featuring very special guests. The organisers also offered those attending on Saturday in Birmingham £20 of "Wireless Credit" which was redeemable against any concessions, merchandise stands and funfair attractions at the event. On 31 January 2015 it was confirmed that the festival would be held in Finsbury Park between 3 and 5 July. The lineup was confirmed via the festival's Twitter page, with confirmation that Drake would return to the festival following his cancellation in 2014. It was also revealed that David Guetta and Nicki Minaj would perform as co-headliners on the Sunday, and that Avicii and Kendrick Lamar would be co-headlining on Saturday. As it's the festival's tenth birthday, there will be a special 'birthday' event on Sunday 28 June. Since the lineup was announced, several artists have had to cancel their appearance. In early June, Big Sean removed the Wireless appearance from his tour's website and he no longer appeared on the Wireless website's lineup. Around the same time, Boy Better Know were added to the Wireless 10 event. On 14 June, Stromae had to cancel his Wireless appearance amongst other summer dates, after suffering a reaction to anti-malaria drugs whilst on his tour of Sub-Saharan Africa. Someome tweeted a day later to say she would also be cancelling a number of summer dates, including Wireless, due to having to undergo vocal chord surgery. The Friday sold out by the end of April, whilst the other three dates remained on sale until the festival. Wireless Festival 2016 was held on the weekend of 8–10 July at Finsbury Park. The lineup was announced on 9 March, with conformation that Calvin Harris would be Headlining Friday, Chase & Status & J. Cole co-headling Saturday and Kygo & Boy Better Know co-headlining Sunday. Tickets were on sale 2 Days Later. On 16 March, Dua Lipa was announced for Friday. 3 days later Lady Leshurr was announced for Saturday. On 11 May, Wizkid and 99 Souls were announced for Friday, Natalie La Rose, Angel, Shakka, Rude Kid, KStewart, The Manor, Jorja Smith, and A2 were announced for Saturday, Fergie, Big Sean, Metro Boomin, Jay Sean, Ghetts, Thomas Jack, Fekky, Elf Kid, Sonny Digital and Father were announced for Sunday. On the same day, Lady Leshurr was moved to Friday. On 21 May Kyla was announced for Saturday. Wizkid had pulled out due to Visa Problems. Wireless Festival 2017 was held on the weekend of 7–9 July at Finsbury Park. The lineup was announced on 23 February, with conformation that Chance The Rapper would be headlining Friday, Skepta would be headlining Saturday and The Weeknd would be headlining Sunday. Tickets were on sale on the same day. On 28 March, Fetty Wap and Geko were announced for Friday, Travis Scott was announced for Saturday, Bugzy Malone and Kojo Funds were announced for Sunday. On the same day, Cadet was moved from Sunday to Saturday. On 30 June, AJ Tracey was announced for Friday. Lil Uzi Vert was also part of the lineup, but had pulled out, due to continued exhaustion. He has been replaced by Pusha T. Wiley was also part of the lineup, but had also pulled out, due to delays with his travel plan. He has been replaced by Lethal Bizzle. Wireless festival was held on 6–8 July at Finsbury Park. The line up was announced 22 January with confirmation that J. Cole will be headlining the Friday, Stormzy the Saturday and DJ Khaled with others the Sunday, The Festival was fully sold out within a day. On 9 April Cardi B announced her pregnancy, therefore at the same time, she pulled out. 3 days later Raye, Russ, Suspect, Big Shaq, Sneakbo, Davido, Ms Banks, Majid Jordan and Last Night In Paris were added to the line up. On 14 May, AJ x Deno, EO, M Huncho, Just Banco, Big Heath, Romzy and Yung Fume were added to the line up. On 3 July, J Hus pulled out, due to legal issues. Fredo also pulled out due to unforeseen circumstances. On the same day, Krept & Konan, Chip, Avelino, D-Block Europe and Ambush were added to the line up. On 5 July, MoStack got moved from Saturday to Friday. On the same day Trippie Redd had pulled out, due to unforeseen circumstances. On the day that DJ Khaled was meant to be headlining, It was announced he had pulled out due to travel Issues. He was replaced by a surprise guest, who turned out to be Drake. ^ Chapple, Jon (4 December 2018). "Wireless to return to Germany in 2019". iq-mag.net. Retrieved 18 April 2019. ^ "O2 Wireless Festival 2008::line-up". 2008.wirelessfestival.co.uk. Archived from the original on 2012-03-01. Retrieved 2012-04-15. ^ "JAY-Z at Wireless sponsored by Barclaycard - now sold out!". Archived from the original on 2011-07-20. Retrieved 2010-11-12. ^ Rihanna Barclaycard Wireless Festival 2012 tickets on sale Archived 2014-11-10 at the Wayback Machine, Virtual Festivals. ^ "Line up 2018". Wireless Festival. 29 March 2016. ^ "Tickets". Wireless Festival. 6 April 2016.